“One of the things I do worry about sometimes among progressives in the United States — maybe it’s true here as well — is a certain kind of rigidity where we say, ‘Uh, I’m sorry, this is how it’s going to be,’ and then we start sometimes creating what’s called a ‘circular firing squad,’ where you start shooting at your allies because one of them has strayed from purity on the issues. And when that happens, typically the overall effort and movement weakens,” Obama said. 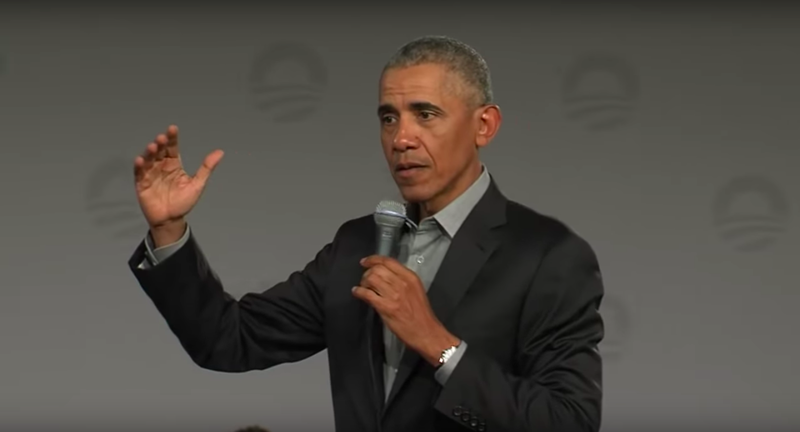 Obama’s “circular firing squad” comment is the part of this speech that is drawing the most criticism, for understandable reasons, but it was actually part of a much longer and even more noxious appeal to the strategy of making compromises within the system to effect change. He cited his own efforts in the Paris climate accord as an example of what working within the system and making compromises can accomplish, fully acknowledging the fact that even if every country in the accord fully met its burden, it still wouldn’t be sufficient to avert cataclysmic climate disaster. And we all know what happened there. Obama legitimized an accord which amounted to nothing more than a Sesame Street children’s band-aid on a sucking chest wound, collected all the political accolades as a champion of the environment while continuing to quietly bolster the fossil fuel industry, and then when the pendulum swung back to the other head of America’s two-headed one party system, the US government announced its intent to withdraw from the accord. So we’re left with a former president surrounded by a very attractive narrative of progressivism who actually accomplished nothing besides continuing and expanding Bush’s wars and Orwellian surveillance programs, absolving the crooks behind the Global Financial Crisis, and continuing the crushing neoliberal policies which led to the American people’s collective middle finger to the establishment in electing Donald Trump. That’s your legacy, Barack. I don’t pretend to know exactly what’s in Obama’s heart, or what used to be. The money he’s been raking in for Wall Street speaking appearances certainly doesn’t paint the picture of a man who regrets doing the sleazy things he did while in office, but when he first entered politics it’s entirely possible that there was some intention mixed in with all the ambition to make some positive changes in people’s lives if possible. But his notion that you can work within the system to affect positive change has been soundly debunked by his own legacy, and by the disaffected populace that it created. Trying to work within the system to effect positive change is like trying to dry your hair with rainwater. 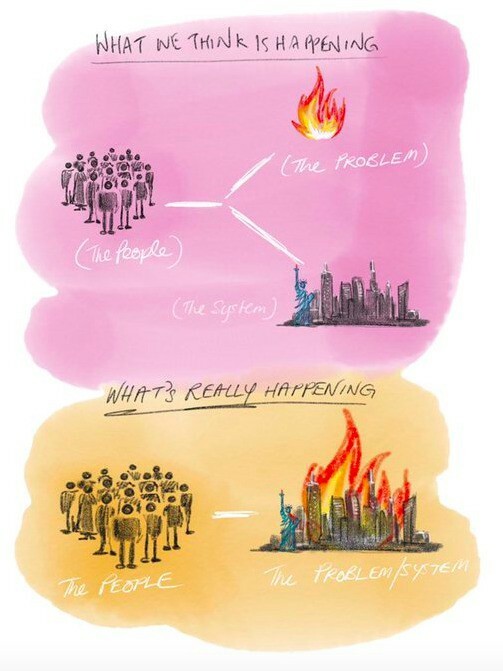 It’s never effective to use the system for solving problems, because the system is the problem. Proponents of Obama’s approach describe an inaccurate picture of what’s going on. They describe the people as being over here, their problems being over there, and then the system that you can use to solve the problems as this other third thing somewhere else that exists separately. In an accurate picture, the people are over here, and the problems and the system are one inseparable thing sitting across from them. The fact of the matter is that the entire US political system has been deliberately slanted to favor the plutocratic class, and the plutocratic class can only exist in an environment of inequality and oppression. A system where money translates directly to political influence necessarily creates an environment where those with money are able to rule as kings as long as they can keep all the money to themselves. Since money equals power and power is relative, those with the most money are naturally incentivized to keep money out of the hands of everyone else, because if everyone is king then there are no kings. The poorer they can keep everyone else, the more relative power they have. They’re able to use their wealth to buy up political and media influence, whereas the rest of Americans, most of whom would struggle to pay even a one thousand dollar emergency bill, are unable to do anything similar on anywhere near that scale. This is why Americans have the problems that they have, and you see the same dynamic mirrored in other nations throughout the world. There are people who benefit from keeping the public poor, uninformed and powerless while reaping huge profits from ecocidal capitalism and war profiteering, which in turn gives them even more wealth and therefore even more power over the masses. This is the dynamic you must necessarily climb into and make your home in order to “work within the system”. I call Obama’s particular brand of establishment sycophancy Nice Guy Fascism. It’s just like regular fascism, enabling the brutal dominion of a few depraved and bloodthirsty tyrants, except you get to look like a nice guy while you’re participating in it. You claim you want to help people, but you put on the uniform of fascism and advance its pernicious ideology in order to do so. To “work within the system” you have to climb into the system, ingratiate yourself to the system, and keep the system sufficiently pleased with you so that it won’t reject you like a mismatched organ transplant. You’re covering yourself with feces and then running into the crowd trying to wipe the dirt off them with your hands. So what can we do instead? Well, the dynamic I just described means that all the power has been stacked heavily in favor of status quo power structures, so it’s not an easy fix. It’s not as simple as starting a new political party or organizing more effectively, because the system is already deliberately stacked heavily against exactly those kinds of escape plans. What we’ve got to do is work way outside the system and weaken public trust in it, with the hope of awakening the masses from their MSM-induced coma and persuading them to use the power of their numbers to shrug off the plutocratic oppression machine that’s been squeezing them their entire lives. The way to do that is with relentless acts of narrative sabotage at every opportunity, exposing the lies of the narrative matrix and reducing the public’s already low trust in the mass media to nil. We’ve got few things working to our advantage toward that end, but they are powerful. We’ve got the fact that we’ve got enthusiasm and creativity on our side, while establishment cronies are boring, artless, unfunny, permanently uninspired, and reliably several steps behind the zeitgeist. We’ve got our unprecedented ability to network and share information. And we’ve got our species’ capacity to awaken from its dreamlike relationship with mental narrative, which I believe could be the X factor hidden below the surface of the human experience which leads to the creation of a healthy world. It’s not much, but it’s what we’ve got, and it’s a hell of a lot more effective than Obama’s recommendation of towel drying while submerged underwater.